Miss Universe 2005 NATALIE GLEBOVA of Canada is the official Female host of Miss Global 2016 Pageant to be held in Manila, Philippines on September 24! Natalie represented Canada and won the Miss Universe 2005 pageant held in Bangkok, Thailand. She was married to Thai tennis superstar Paradorn Srichaphan in 2006 but were divorced in 2011. On April 9, 2016, the Russian-Canadian gave birth to a daughter, Maya Kelly, with her fiancé Dean Kelly, who won Mister Panamá 2001. 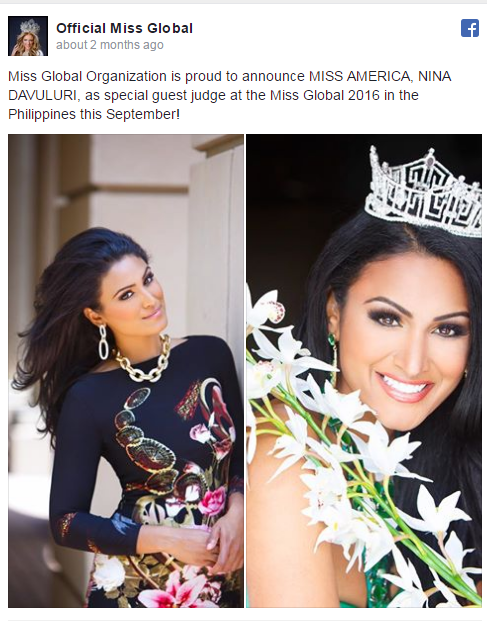 Nina is the "first contestant of Indian descent to win the Miss America Competition" (as well as the second Asian American). 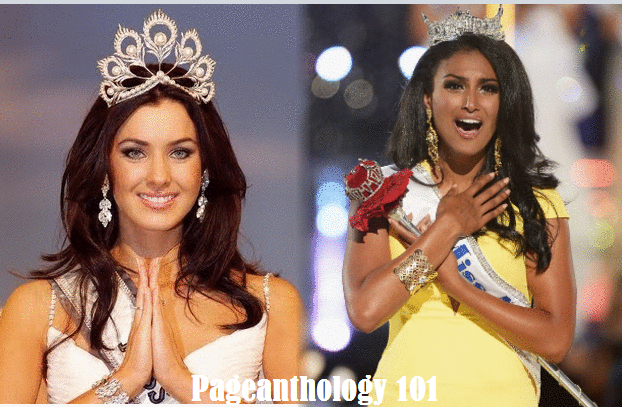 Shortly after becoming Miss America, however, Davuluri became the target of xenophobic and racist commentary in social media. The American public speaker and advocate for civil rights and humanitarian causes represented New York in Miss America 2014. The Miss Global 2016 pageant will be held in the Philipines on September 24 at the Philippine International Convention Center. This marks the second consecutive time the Philippines is hosting the Miss Global pageant. Miss Global Organization proudly marks its 4th year pageant in the International Arena, with this year's 50 exceptional ladies coming from different parts of the world vying for Miss Global 2016. The goal is to crown a deserving winner who possess the quality of an Empowering women that will embrace one's culture and embodying the beauty within. The winner will serve as an ambassador of goodwill help promote Philippine tourism. She will also help promote Senhoa Foundation in supporting vulnerable persons and survivors of human trafficking. 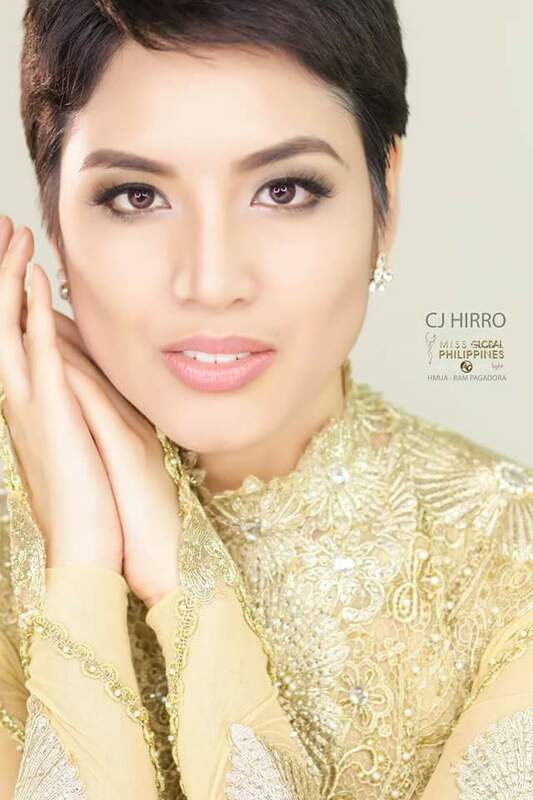 Miss Global beauty pageant set the new standards for a wider age range and a more diverse selection of qualified female participants between the ages of 18-35 and welcomes single mother candidates. Pageant Motto : "Empowering women, Embracing cultures, and Embodying the beauty within"
28 year old short haired beauty from Pampanga CAMILLE HIRRO is the host delegate.